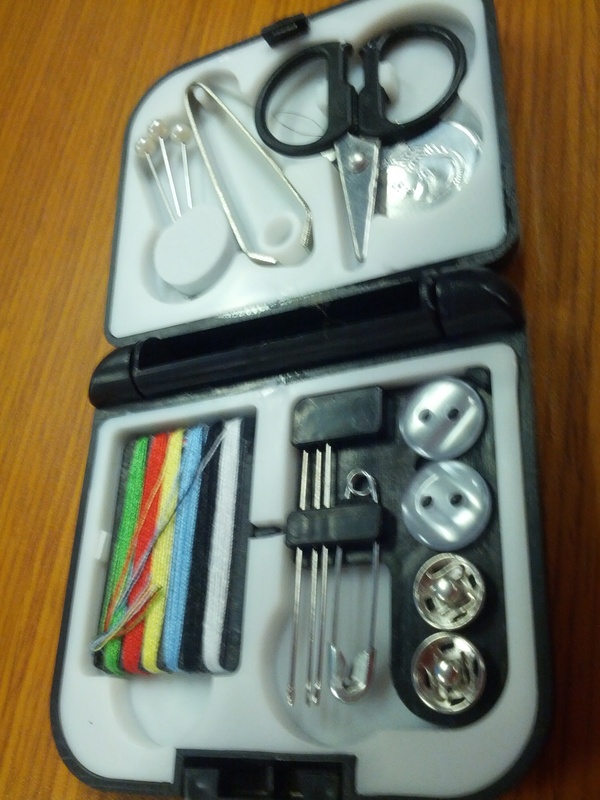 The sewing kit I carry in my purse…for emergencies! I would consider myself to be a crafty kind of girl. I’ve done all sorts of things like painting, needlepoint, floral arranging and scrapbooking, just to name a few. I remember getting an assignment in grade 7 home economics to buy a pattern and sew an article of clothing. Did I pick a skirt, like most of my friends? No, I picked a jumper dress and then picked denim as my material of choice. I was doomed even before I began. But I tried…and I failed. Oh, I finished it (perhaps with or without the help of my mom) to my defense we didn’t have a modern century sewing machine, but instead an old pedal-style vintage Singer sewing machine, which I wasn’t allowed to touch. I think I may have passed, but I don’t remember, I just know that I never wore that creation afterwards and it pretty much cemented that I would never be a fashion designer. My mom still brings it up every once in a while, something like “Tania, remember that dress you made? Whatever happened to it?” I don’t blame her though as the materials to make the dress cost her a pretty penny. But it’s not that I didn’t want to learn, I just never saw the point. If something didn’t fit, my mom fixed it. If a button came off, my mom fixed it. If my pants needed hemming, my mom fixed it. She still does, in fact, and I’m perfectly okay with that. I’m also okay with paying somebody to do the above mends and alterations. My mom could do those things, but she was never one to just whip up curtains, skirts or other articles of clothing. She fixed stuff. Her mother, my Nonna Angela was a sewer. I consider her the original crafter in my life. She sewed her own clothes, she knit, crocheted, did needlepoint and could bake the pants off anyone. I would like to think my crafty side came from her. I just missed the needle on the sewing thread…pun intended! I bet you’re wondering if I’ve just never have a button fall off, or if every pair of pants I’ve bought fit perfectly to my height? Nope. I am not ashamed to ask my mom for help. She would either fix, mend, hem or sew said article of clothing at my house, or she would take it away and it come back fixed. I’ve even heard my daughter say, “oh mommy, we have to ask Nonna to fix this,” when she’s seen a hole in her sock. For the record, I can sew on a button and fix a hole on a seam, but it’s not pretty. It’s only under emergency situations that I will pull out the sewing box (a small plastic container with the basics and a few spools of thread). Only under emergency situations. Sad? Yes. I fully admit that. But honestly, it’s not a craft I’m interested in. I recognize that it’s a skill I should have, but it will have to wait until I have so much extra time on my hands that I can take a sewing 101 class. I have since let my mom off the hook and found a seamstress close to home, who I pay to do all my alterations. And it is worth every penny.